I've tried this with a number of different settings, but I still get an error. "A modem error occurred. Please verify your settings and try again." Anyone know any way to figure out which settings are preventing connection? I forgot to add a step, that I didn't go through before. After step "7" click Advanced, you should then be presented w/ a screen to select your modem vendor. 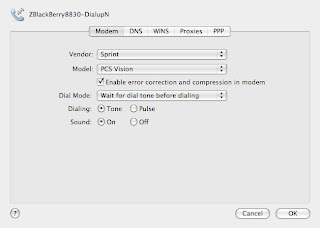 You need to select Sprint for the vendor and PCS Vision for the model. I'll be posting an update shortly. Last, but not least, Sprint must have enabled your phone for "data tethering" for this to work. There is a usually an extra cost associated with this feature. Worked nicely with bb 8130, macbook pro and sprint vision. Everything else that I had tried seemed targeted to verizon, and the #777 trick (outlined elsewhere on the web) didn't work for me. Thanks! Much appreciated, I was looking for the post on tethering at crackberry after I formated my macbook. Although, your tutorial is quite detailed and informative. This is a great post and your instructions worked like a charm. I had seen a number of suggestions for connecting with Sprint and all were incorrect except yours. Thank you very much. Thanks for the write up. This works as advertised, and I am in fact posting this comment while tethered! Nice! This was such a lifesaver. Thought that I was doomed to never use my bb for tethering again after switching to mac. Thanks! oh ps I used a 8330 curve with sprint. Umm, it might work. Truthfully I haven't tried. I'm not even sure the Mac will recognize the blackberry when connected via USB. I was thinking I could bring my 8330 right to the Mac store and try these instructions. But just to confirm: We expect this to work? As long as your Blackberry is enabled for tethering, it should work. You can check w/ Sprint to confirm that you pay for the service and that it is enabled. Awesome, thank you. I am posting this on a tethered blackberry right now. Iphone/Att better work this out soon as that's bulls$%t that it doesn't work now. you rule, found 20 different post that didnt work, your's did and flawlessly I might add, Bravo and BooYah! to the the companies charging $60 for tethering software. macbook running 10.5.0. And YES, I have the sprint simply everything plan. bb 8830. It is slow as hell, though. I'm wondering what kinds of speeds are you all getting? I posted this message on that connection. I wasn't in the fastest area, but it works. Will continue to test it in a few different areas and report the speeds. Connected for over 40 minutes solid now. Now if only we can tether with the USB. That will be the day. I'll still keep the tetherberry. As I think once their mac software comes along, it will be worth it. Their windows version works great. Don't hesitate to change settings one-by-one and see if you can still get a connection or even a faster connection. Works great with my unibody Macbook Pro and Spring BB 8830. Have found other tutorials on the web, but this one works! Thank you thank you thank you! i've been looking for ages for info on how to make this work...and you did it! Worked perfectly. Thank you very much for making this post. Thank you very much. 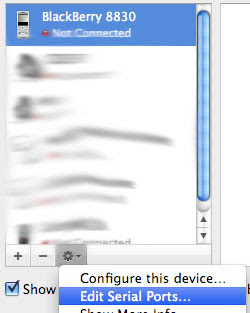 I have been searching for a way to successfully tether my blackberry to my mac for the past six months to no avail. You saved me from having purchase an aircard and it's associated monthly service fees. Thanks! Works great with my 8330 and Macbook Pro. A couple of notes... For the final step (under Network when setting up the Blackberry Dialup) when I was manipulating the advanced settings, I had to change it to "Ignore dial tone when dialing" for dial mode instead of "wait for dial tone...". Otherwise I would get "A modem error occurred." Also, when pairing under Sprint/ Vision your user and password may be left blank. Thanks again. Incredible! Something i have never been able to achieve with a PC. This took 5 minutes!! 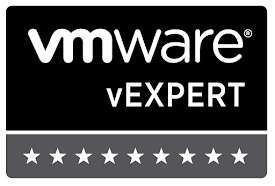 ZSoldier, you rock!! I've been trying to do this for 2 months and just found your post today! THANK YOU!!!!!! It seems that for the non unibody Macbook (mine is black) you don't have to uncheck "ignore dial tone when dialing" because I set up as per your posted instructions before reading all of the comments and it worked just fine. The process actually took off after I read your comment that the Mac might not recognize the device if it was connected by USB. After I disconnected it, it worked instantly. Thank you so much for posting this!!!!! I can't believe that the Sprint FAQ says you need an Apple Modem Script to access the internet via the Curve 8330. By the way, I've read that there's no extra charge to use BlackBerries as modems all over the internet and couldn't find an option to add some kind of modem service to my plan (a normal one + the mandatory $30 BlackBerry Personal Pack not the Simply Everything Plan). I guess I'll see if this results in any new charges on my next bill. Thank you sooooooo much. I have been working on this for 3 days. Followed your instructions on my sprint 8330 and it worked immediately! So, this has been working for me for months, and suddenly it doesn't. I've tried the battery pull, to no avail. When I try to connect, I see a message on the Blackberry "modem mode enabled", but then that message goes away in a second or 2. I've noticed this issue too, not sure what causes it. It doesn't seem to be related to the blackberry, but with the settings on the Mac not sticking with something. Have you tried going through the setup steps again? Yeah. They probably turned off your tethering. If so, there's no way around it. So like egilchri says, your tethering service may have been turned off. Call your service provider. Or I would suggest going through the setup steps again, I've noticed that the mac sometimes drops the serial port for the blackberry and causes this issue. Going through setup a second time usually resolve this. I can confirm also that it worked several times for a few months in the past. But over the last 3 weeks, it did not work. So for now, tetherberry is the way to go. Tetherberry has come a long way and gets the job done. First of all, thanks for posting these directions. 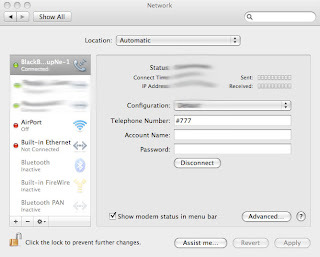 They have, by far, been the best directions for tethering blackberries to mac os x with snow leopard. However, I am still encountering the "modem connection error" problem, even when trying out some of the different option people have suggested. 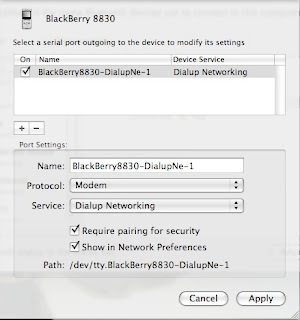 I just recently got a blackberry for christmas and am wondering if there are any recent changes that are keeping me from tethering to my macbook pro. I am under the "everything data share plan" so it should work, right? Thanks in advance for any help! Thanks for the instructions! However, I couldn't get this to work either. They did offer a "free" data card -- with a $59.99/month, 2-year service agreement. This was the most straight forward post on the subject. I tried for several hours to figure this out. Thank you so much for taking the time. I've tried a couple times to set this up but when I go to connect it says "connection failed cause the communication device is unavailable"...can you help me? It's difficult to say what the issue might be. You may need to re-pair your blackberry to your Macbook using the bluetooth wizard.